Sodium percarbonate is very neat stuff. It is a powder that releases hydrogen peroxide, and it is very concentrated. To be complete, sodium percarbonate releases hydrogen peroxide and soda ash. As we know, hydrogen peroxide breaks down into oxygen and water. As you may expect, then, sodium percarbonate breaks down into oxygen, water, and soda ash. It is a granulated powder – which can be nice for scrubbing stains and stuck-on-gunk off of dishes. Think of scouring powder, but made out of hydrogen peroxide. It can be made into a paste, too, and used on tile grout and tough stains. It is easy to carry around -- say, to a laundromat – because of its dry powder form. In fact, laundry products are one of the big applications of sodium percarbonate. It’s cheap. Really cheap: a few dollars for a little tub of it. The recommended amounts are small, it is very concentrated. It is less likely to splash and spill than liquid peroxide, so it is safer to work with. One does still need to be careful with it, but mostly once it is mixed into water. Because it is so very concentrated, it is easy to use too much. It’s tempting (and easy) to sprinkle some on a stain and scrub it in, when a much less concentrated form would likely do the trick. In many cases this is okay -- once in a while it could get you into trouble. The usual cautions for hydrogen peroxide also apply to sodium percarbonate: check for colorfastness, keep it out of eyes. After you mix it in water, the label cautions that you must not seal the container. The sodium percarbonate will continue to break down rapidly and release oxygen, and the container could burst! It is recommended to mix it into HOT water. I tried mixing some into cold water, and it does work to mix into cold water, so it is not required that you use hot water -- but it mixes more easily into hot water. I don’t know anything about soda ash. It sounds innocuous, which proves nothing. It takes some time to completely dissolve. If you're in a hurry, liquid peroxide is faster, since it doesn't need to "break down" into peroxide (it already is peroxide). Sodium percarbonate needs to break down to turn into peroxide (and soda ash). I've been asked about where to buy "pure" sodium percarbonate, so I'm including a source, below. Please note that the percentage of sodium percarbonate (the "purity") will vary. You can likely find some that is 97% or 99% pure, but 100% is less likely. In addition to what's on Amazon, I've also found sodium percarbonate on eBay. Sodium percarbonate is generally considered environmentally friendly. However, don’t get it confused with Sodium Perborate – which is made from borate, is NOT good to get on plants, and is considered somewhat harmful to the environment. Many sodium percarbonate products also contain sodium carbonate. Sodium carbonate is soda ash. Sodium percarbonate is hydrogen peroxide and soda ash. So, sodium carbonate is kind of “more of the same”. Sodium percarbonate is really easy to use for cleaning, stain removal, and laundry. Most products come with a chart that shows how much to use. Sodium percarbonate is great for applications with HOT water – such as mixed into the soap solution in a carpet cleaning machine, or mixed with HOT water to mop the floor. Sodium percarbonate is great for cleaning and disinfecting – for things like cleaning out the cat box, the birdbath, bedpans… Just mix sodium percarbonate in HOT water, fill your (empty) cat box or birdbath or bedpan, and give it time to soak. Just like hydrogen peroxide, sodium percarbonate needs to have time to do its work. The suggested amounts for this are usually small – so, one or two scoops (at 2 tablespoons per scoop) is probably enough to clean a whole cat box (filled with water), or a whole birdbath (filled with water). Use HOT water for this. You can also mix sodium percarbonate into a thick paste to use on tile grout. If you think of sodium percarbonate as an alternative form of hydrogen peroxide, that pretty much covers it. It can be used for most of what hydrogen peroxide is used for, bearing in mind it is a powder, and breaks down into peroxide plus soda ash. ”Oxygen” products seem to be really “in”, and thank goodness! When I see "oxygen products" -- like “oxi-something", “oxo-whatever” and “oxygen water” -- right away I want to know “what is it?” Is it hydrogen peroxide? (Sometimes it is.) Is it sodium percarbonate? (Yes, sometimes it is sodium percarbonate.) And sometimes it is something else. Looking for “sodium percarbonate” on the label will “solve the mystery” in at least some of the cases. A lot of the "oxygen" products are sodium percarbonate products. How much sodium percarbonate is in products made with sodium percarbonate? Unfortunately, different products contain differing amounts of sodium percarbonate, so it is hard to make direct comparisons of price or of the amount to use. Most products use sodium percarbonate mixed with additional sodium carbonate. The amount of sodium percarbonate varies. However, with that said, sodium percarbonate is generally very concentrated, so a few tablespoons of a cleaning product in a gallon of water is what’s recommended for most general cleaning applications. If you are wondering where to get this amazing powder, well, you may already have some around the house. Check your laundry detergent. 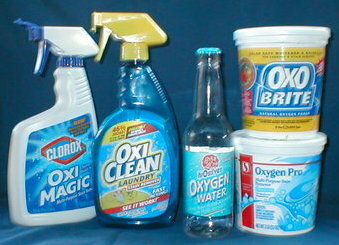 OxiClean sells a wide variety of products for many uses. If you look at these products (and others like them), you may notice they cover a lot of the very same uses as hydrogen peroxide! For instance, they have products for dishwashing, carpet cleaning, stain busting, laundry cleaning, and removing pet stains.... Does that sound familiar? All of these are uses for hydrogen peroxide, and sodium percarbonate! It all comes back to OXYGEN. Sodium Percarbonate “Soak” Test -- DO Try This at Home! I noticed a plastic cat brush that looked a little dirty, and tossed it in, as well. Now, you never really know how dirty something is until you clean it, don’t you think? Actually, it was the color of the wash water that was the big thing. Oh my, gross indeed. Gross, but it also gives me the feeling I’m accomplishing something! Everything came out nice and clean (after thorough rinsing, of course.) The cat brush looks great too.